Get a slip, poppet. One lining, many skirts ;-)! We are all sworn to secrecy! 🙂 And also, it’s little wonder you have to lop 5 inches off the bottom, your version is riding lower at the waist than the pattern would have called for. I think it looks fabulous on you, the way you have made it, mind you! And v sassy photos too! I think you are so right MrsC. I should really have lined it but for quick emergency makes, a slip would defo save the day. I hadn’t clocked I was wearing it so much lower than in the illustration. Glad you pointed that out too. Was beginning to get height issues! Oh…you little vixen you…now I want to get my machine cleaned and go…back at it!! Thank you for the inspiration. lol… thank you! You are most welcome. You won’t look back I can assure you. It’s so addictive! This is absolutely frisky on you! Extra points for styling worthy of a Puppini Sister! I love the skirt, but where did those gloves come from? Just devine!! Thank you Ronda. The gloves were a fabulous gift from Mr Ooobop! They were from Aspinal of London. Here’s a link: http://www.aspinaloflondon.com/eshop-catalogue/ladies-collection/ladies-leather-gloves I am very spoilt! OMG! Love the skirt, love the buttons! And Wow!! You have a very cute figure!!!! You go girl! Really awesome skirt. I love vintage patterns as well and have a bunch I’ve found in thrift stores. Since fashion always comes around again I see it as a worthwhile investment. 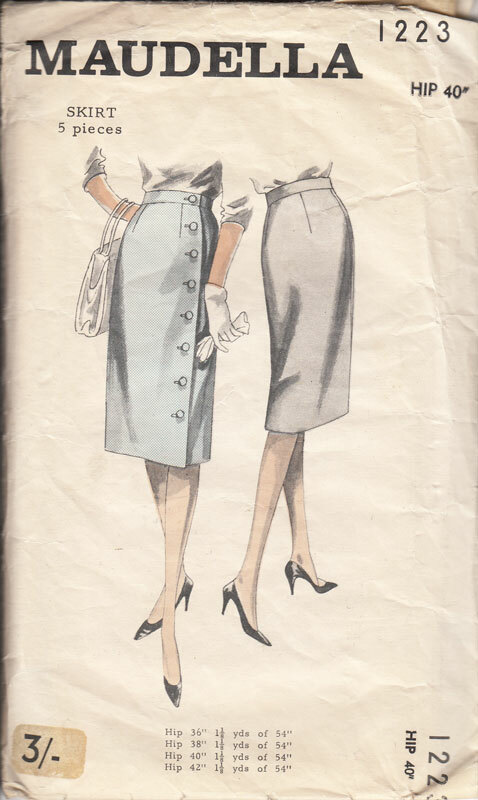 A skirt like yours is totally timeless! Thank you for stopping by to comment. I agree they are a fabulous investment. I can spend hours just looking at them! Ohhhhhh so delightful! Lovin’ how you styled it with the gloves and all. The photos are great! Thank you Beth. Mr Ooobop! got camera-happy again! Gorgeous! Loving the buttons, and the gloves. Phwoar! He he… thanks Kat. Yes, I think I knew it was going to happen but I was in denial as usual! That is such a cool skirt! Love it. Love how you’ve styled it and top points to your photographer. It’s achingly cool. Wonderful! The skirt, the gloves, the stockings! Love it. With that body you are a perfect dresser! great garment! Thanks Liora. You say the nicest things! I personally think its all down to the clever photography skills of Mr Ooobop! I will seriously kill for your shoes. And the. Buttons are so cute. Mr. Ooobop side knows how to spoil you. I think it will be easier to make slip. That way you always have one should you need it. He he… thanks Miss Dibs. I do like a nice shoe! I was thinking of just buying one but funnily enough I can’t bring myself to do that. So Im off to research some silky lingerie fabric! Totally gorgeous skirt – and you’re right, you are spoilt 😉 Fabulous photo too! Very nice – classic glamour! Ooh la la I LOVE this! So gorgeous. What a totally yum look! Black and white always wins me over.